Annual Lighted Boat Parade Lights Up NY Harbor Tomorrow! Take a break from fighting off the screaming tourist hordes that have descended upon our city for the weekend and revel in the quiet beauty of pretty ships cruising around the harbor tomorrow night at the annual Lighted Boat Parade. 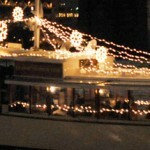 New York Harbor tour boats, work boats, private boaters and charter yachts will gussy up their vessels with twinkling lights and holiday decor (including a very special maritime old St. Nick on the last boat). The lit boats will gather at Pier A, travel up through Brooklyn Bridge Park, then move north along the Brooklyn Waterfront, passing under the Brooklyn Bridge and doing a tight pass along Manhattan’s waterfront at South Street Seaport. Here’s a map of the best places to catch the ships, and there are tickets available for a seat on the glamorous Adirondack Schooner, which will lead the parade this year. Don’t forget to winterize your Topsiders! Comments Off on Annual Lighted Boat Parade Lights Up NY Harbor Tomorrow!